I just want to say that fiber-ly speaking, I play both sides of the field. 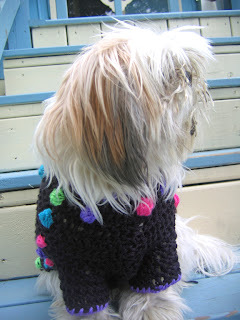 I love to knit, I love to crochet, and I love to do both in same project (although as a designer that can often limit the markets to which I can sell the pattern). 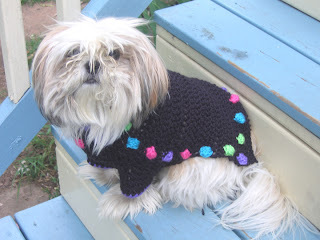 Many folks, however, seem to think that one should knit or crochet but not both - there are those who associate strongly and emotionally with one technique or the other and view the "other" side with suspicion. Which I don't exactly get, although I have seen over and over that this mutual distrust does in fact happen in the real world. So here I was at TNNA, happily moving back and forth between promoting my knitting book and hanging out with my crochet posse of friends, a victim (sigh!) of divided loyalties. 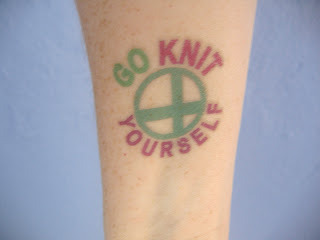 So this was the look of my right arm when I was doing the knit thang - temporary tattoo gleefully provided by the lovely Gina at Alchemy Yarns. 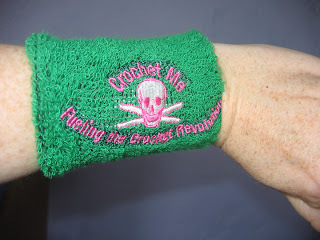 And here is my right arm when hanging with my crochet pals - knitting tattoo covered by this terrycloth band from CrochetMe.com. How convenient that I had both goodies to play with, yes? I suppose if I had really wanted to make a statement I would have worn both at the same time...hmmm....food for thought. 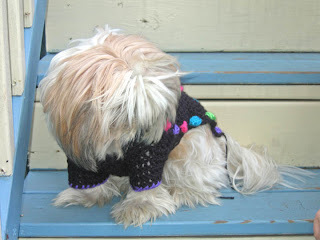 No really, I am too shy, I don't want to pose for a photo for the blog... I mean it, go away! 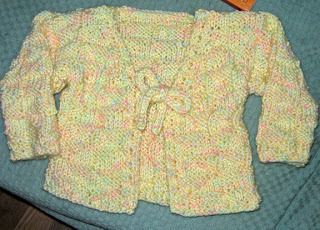 Sweater is crocheted in Simply Soft Brites by Caron Yarns, and the pattern will be available soon. I added the purple crab sticth to the sides and back of the sweater after this photo was taken, so those of you who prefer symmetry have been appeased. Back in the saddle again after recovering from TNNA and finishing a poo-load of projects. The good news is - I managed to get packed and out of my house on time at 4:30AM - the bad news is, the first thing I did after getting through security at the airport was to spill coffee down the front of my shirt. I did manage to wash most of it out, but there was a sort of wet t-shirt contest whiff about the affair. 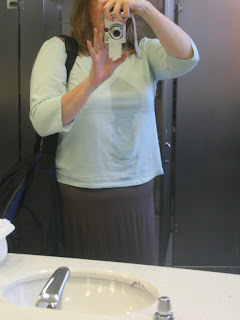 Here, in my homage to Crazy Aunt Purl and her predilection for taking photos in ladies' rooms, is proof. But I dried, and I flew and I got to the hotel, good news. The bad news is I pretty much had camnesia all weekend. The good news is the book signing went really well - thanks so much to all who attended, got books, and came back later to tell me that you loved it. 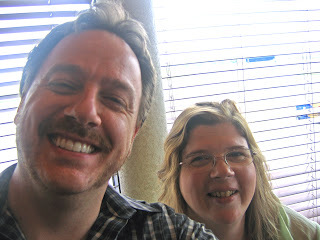 I spent most of Sunday having Sally Fields moments - "They like me, they really like me!" The bad news is I came down with a wicked round of food poisoning on Saturday night, and am still, three days later, feeling kind of cruddy. (The secret good news is at least I lost five pounds, although I wouldn't recommend this diet to anyone). The bad news is, when it was finally time to leave my flight was delayed by two hours. The good news is that I got to spend that waiting time with my dear buddy The Crochet Dude! He had been at TNNA for a book signing also - of the fabulous Men Who Knit and the Dogs Who Love Them which he wrote with Annie Modesitt. I had such an amazing weekend, saw so many wonderful people and books and yarns and designers and designs. And now I have to go back to bed. More soon, I promise.